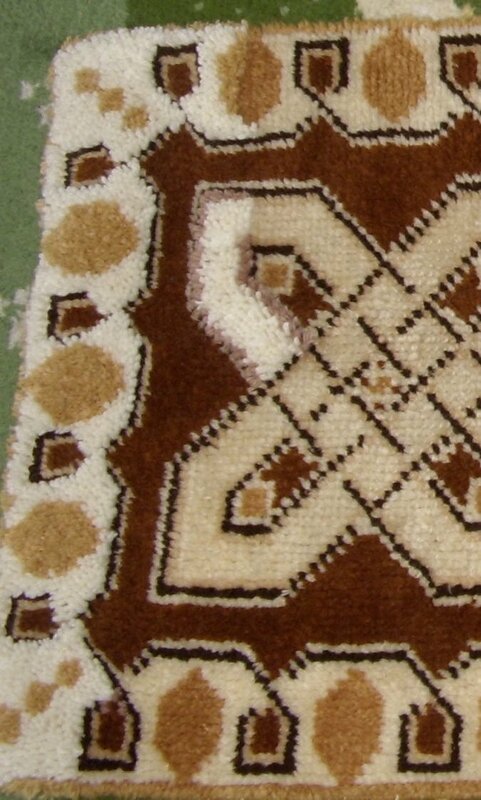 One great thing about latch-hooked rugs is that they can be reworked if dmaged or worn. 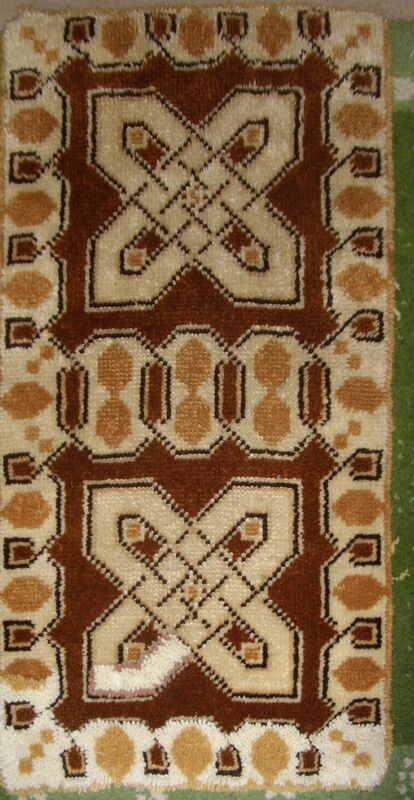 Sometimes only part of a rug needs to be restored, but there is no modern colour-match for parts of the pattern. One best solution is to unpick that colour throughout the rug. Another solution is to choose the nearest match and create a mottled effect: unpick some of the original colour from good areas and replace those knots with the close-match colour, then fill in the area being restored with a mix of the reclaimed strands and the new colour. Mottling is more economical than buy an additional pack of yarn. 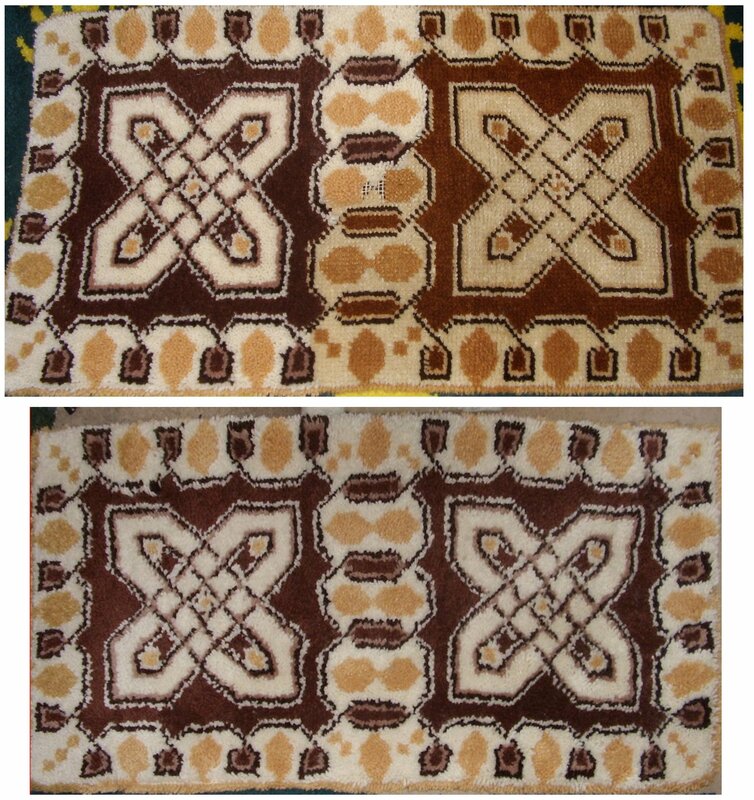 During spring 2014 I reworked a second hand rug by unpicking sections and re-hooking them with new wool. It was satisfying to see the new, fresh colours creep further and further along the rug. 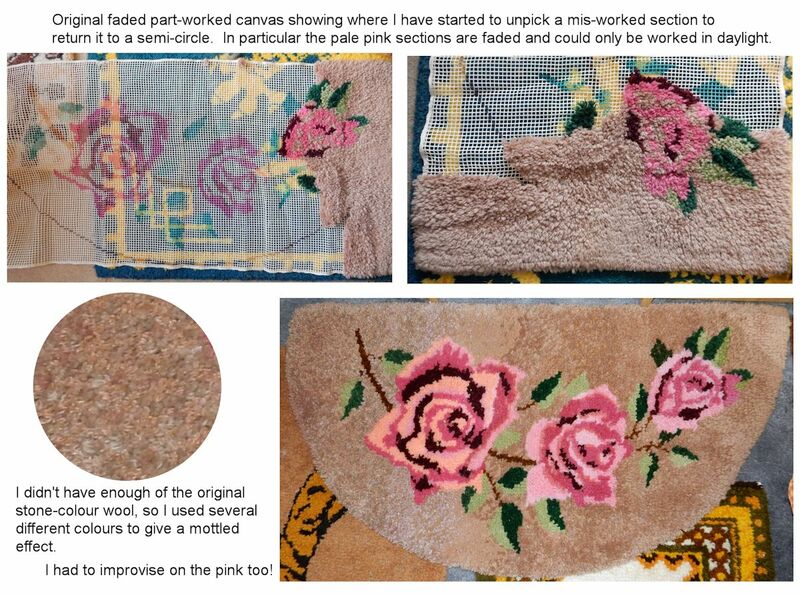 I bought the decades-old rug at a boot fair as either a rework project or to re-use the canvas, depending on the quality of the original latch-hooking. The yarn originally used was wool/acrylic mix and in many places it was worn right down to the knot or crinkled from being exposed to sunlight or heat from a living room fire. Many of the knots in the central area were already coming undone. I've noticed that acrylic mixes tend to become coarse after a long period of time, so I decided to rework the pattern in pure wool. My first job was to wash the rug because the ingrained dirt meant it wasn't very pleasant to handle. Colourfastness wasn't a concern so I ran it through the washing machine at low temperature. The original colours easier to ascertain from the back of the rug where it hadn't faded. From the photos, you can see that the original colours were a pale cream background with a dark tan, dark brown and light tan design. Less easy to see due to general discolouration was the dark cream/pale beige part of the pattern bordering the dark brown detail. Reddish hues, or earth tones, were popular in the 60s and early 70s and years of sunlight tends to bring them out even more. Some of the original colours weren't available so I had a choice of either finding close matches or choosing a different colour scheme that harmonised with the pattern. I opted for earth colours, though the geometric pattern would have worked well in green and cream. The new colours are white, champagne, dark tan, dark brown and beige. I had several of these to hand already. The modern dark tan was the closest match I could find to the original colour, but is less reddish. The light tan was replaced by Iriss of Penzance “champagne” which is paler than the original light tan, but was the closest available match. The original dark cream detail was so indiscernible against the pale cream that I substituted Anchor beige to improve the pattern contrast. Overall, the rug is “cooler” and brighter looking, but has the same pattern. Here is the rug about a third of the way through the reworking process, and then complete. The difference in pile between the pure wool and the worn and rough wool/acrylic mix is very marked. Below is another part worked canvas I reworked, in this case because the previus owner hadn't kept to the guides for a semi-circular rug.